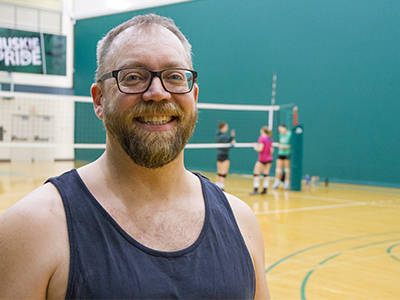 Jeff Drake joins the Huskies women's volleyball team to see what it takes to be a student athlete. Throughout 2016, members of the university communications team are working out with our Huskies to see what it takes to be a Huskie student athlete. In this edition—Huskie volleyball. Jeff Drake, I'm the manager of communications services. I manage the marketing department. 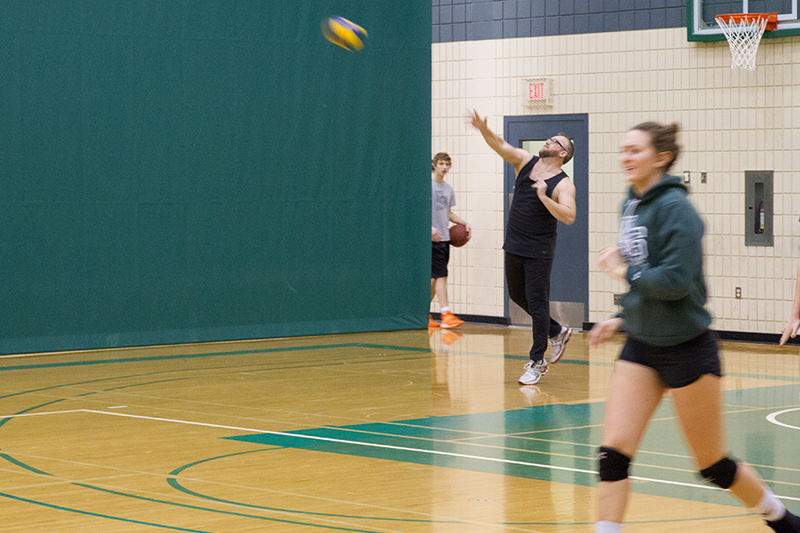 I've played volleyball for 20 years in the beer leagues. I play a couple nights a week in the summer at the sand courts in the bars around the city. The women's team invited me to experience what a day is like for them. So at 7 am I was at the PAC where some players put me through their circuit training. That took two hours. Then I went to the office, then back to the PAC at 12:30 for an hour of drills. Then back to the office, then back to the PAC at 4 pm for a two-hour practice. They put me through more drills and pulled me out when they got into formations to run plays. I was fine with stepping out; I was completely exhausted and overly sweaty. I can't say enough about how much dedication it takes to be a Huskie. I was winded after the first circuit that morning, and this is their daily routine. And in addition to the workouts, drills and practices, they watch tapes of their opponents, attend team meetings and travel across western Canada to play. Plus, this is on top of having a social life and being a full-time student. I don't know how they manage to balance it all but last year half the team was CIS Academic All-Canadians, which means their averages were 80 per cent or higher. It was motivating to be around such top-tier athletes. The speed, velocity and accuracy they have with the volleyball was inspiring. And they truly love the sport. I'm sure they could have practiced for another two hours that night. In my mind I wanted to as well, but my body wanted to go nowhere but my couch.